In 200 days I'll be in Miami, Florida for my sixth Wrestlemania. Chad and I have been to 22, 24, 25, 26, and 27. I'm looking forward to Mania, I always love being there live for it. WWE.com has an interesting piece up based on their "hazy crystal ball" looking forward to April 1, 2012. Of course we already know the Rock will be facing John Cena. The website speculates that none other than CM Punk will be the special guest referee for the match. While I'm not putting any stock into anything the website is predicting, I really hope Punk WRESTLES at Wrestlemania and isn't wasted in a referee role. That being said, I think Night of Champions will start to really lay the foundation for the Road to Wrestlemania. I'm working on a prediction blog and video that will probably go up tomorrow or Friday. I'm waiting to hear officially what's up with the Intercontinental title match. At last report, nothing had been officially announced. Anyway, I've heard some interesting rumors that I won't spread here, partly because I'm not a big fan of blogger and vloggers who spread rumors. Secondly, if you haven't heard these things and they do come true, I don't won't to spoil the surprise for you. I hate it when that happens. So I'm thinking of you here too. Another match being speculated upon is Daniel Bryan vs. Randy Orton for the World championship. 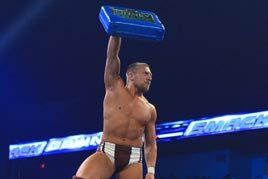 We know that Bryan has promised to cash in Money in the Bank at Wrestlemania. But with Mania still 200 days away, who knows if Orton will still be the champion. I'll admit, I'm intrigued by this matchup. And while I have not yet tasted the Randy Orton Kool-Aid, he is somewhat growing on me. His matches with Christian have changed my view of him slightly, as well as his recent contest with Dolph Ziggler. While I'm not labeling myself a "fan", I don't despise him like I once did. Whoever Bryan faces for the title, I certainly hope he wins. But right now, the WWE needs to start pushing him up the ladder a bit more. As it stands now, I could see him being the first MITB winner to cash in and lose the title match. Dot com is also calling for a Big Show vs. Alberto Del Rio WWE title match. That's really going out on a limb and assuming ADR will still be champ at Mania. Of course with weekly tv shows and seven (I think I counted that right) pay per views between now and April 1, anything can happen. Personally, I don't think the WWE can wait until Wrestlemania for this match. Big Show still has a score to settle with ADR, so I guess it depends on how quickly he returns for his injuries against Mark Henry. It's too early for me to even start writing a Night of Champions blog, much less Wrestlemania, so thank the fine folks at WWE.com for this post. I just thought I'd throw in some opinions. What are your thoughts? Post here or on Facebook, Twitter, or YouTube.